Cherry Trees invite you to come and join them for a war-time themed evening. 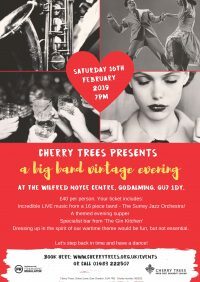 Ticket includes live music from a 16-piece band – The Surrey Jazz Orchestra and a themed evening supper. There will be a specialist bar from ‘The Gin Kitchen’ and much more! Dressing up in the spirit of our wartime theme would be fun, but not essential. Tickets are £40 – to book please click here or call 01483 222507.